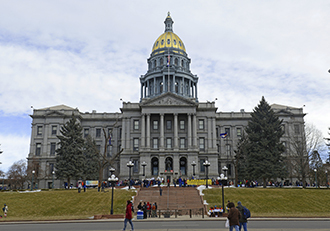 The 40 agricultural organizations that make up the Colorado Ag Council will once again host Ag Day at the Capitol, starting at 10:45 a.m. and featuring the teaming up of local chefs, lawmakers and others in a cook-off competition of Colorado-grown foods. Lunch will be served at 11:30 a.m.
Producers, the public and media are all invited to attend the event, which takes place as part of National Ag Week. Ag Day at the Capitol has become one of the most popular events under the Golden Dome, attended by about 500 people, including the governor, state legislators, farmers, ranchers and many others. Each year, the event showcases all that Colorado's ag industry does for our state, highlighting its efforts in feeding Colorado's 5 million-plus people, its stewardship of our resources, and its $40 billion economic impact - a top two or three contributor to the state's economy each year. The event will also recognize the ag industry's incredible generosity to those in need. According to Kevin Seggelke, CEO of the Food Bank of the Rockies, Colorado's ag industry is continually one of its biggest supporters. In 2015, the total value of Colorado ag products distributed by the state's five Feeding America food banks amounted to about $15 million. Most recently, Colorado's farmers and ranchers took part in a friendly Super Bowl Food Drive competition with producers from North Carolina, to see which state could donate more to local food banks in the weeks leading up to the big game. "Our agricultural producers positively impact the everyday lives of everyone in this state, and it makes me very proud to be associated with this industry," said Colorado Farm Bureau Executive Vice President Chad Vorthmann, who serves as chair for the Colorado Ag Council. "For all that they do, our farmers, ranchers and agribusinesses truly deserve to be celebrated year-round. I can't encourage you enough to join us for Ag Day at the Capitol, and take part in a well-deserved 'thank you' to our producers." Anyone looking for more information about Ag Day at the Capitol can contact event manager David Collie at david@5280culinary.com.